Projection Screen Technical Support - JUMBO Projection Screen Co., Ltd.
1‧For maintaining product’s quality, non-professional person please do not disassemble the product. 2‧In order to avoid electric shock and fire hazards, please do not expose this product to rain or moisture. 3‧After the installation is completed, please do not climb on the screen or use the screen as a fulcrum to avoid the risk of falling. 4‧To protect children from the operation of the controller and a remote control and to avoid damage caused by improper use. 5‧Please do not expose screen to air for long time, so that this will not make the screen oxidizing, covered with dust and accelerated its aging. 6‧If you buy pearl screen, please avoid touching directly on the screen surface, so as to avoid falling its beads. Install the slide mobile hook horizontally on wall or ceiling at the location that is needed for screen. After the mobile hook is located, then hang the screen directly. Then pull out the mobile button on the top of hook and buckle into the main track of the top of the screen. Wrench the screws on buttons of the hooks on both sides. Connect the power cord and the line of control that the installation is completed. Install screen：According to different installed environment, it is free to adjust the location of the screen, the screen can be adjusted left or right to a fixed location. 1‧After mounting the bracket, put the track of main screen respectively into the slide groove on the top of hooks and fix the two sides. 2‧And then pull out the spring-buckle and clip the spring-buckle into the rail system. on the back of the screen respectively. 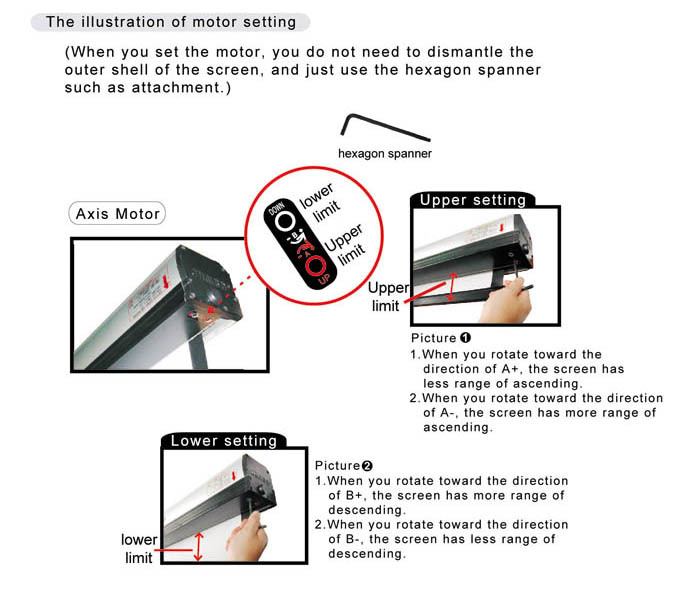 3‧Hang the main screen and adjust the location of the screen to a fixed position. 4‧Use hex spanners to tighten the screw on the button. Motor setting is divided into UP A & DOWN B two control parts. At the bottom of the screen, the screen exit, there are a red hole and a white hole. Please use Hex Wrench to set upper and lower limits. 1‧Facing the front of the screen outlet (Red hole). 2‧A is up limit setting, and divided into A+ and A-. 3‧The screen will be rolled up less if you turn to A+ direction. 4‧The screen will be rolled up more if you turn to A- direction. 5‧There are 2.5cm by turning a full circle each time. 1‧Facing the front of the screen outlet (While hole). 2‧B is down limit setting, and is divided into B+ and B-. 3‧The screen will be rolled down more if you turn to B+ direction. 4‧The screen will be rolled down less if you turn to B- direction.